An important part of the success of Netflix's adaptation of A Series of Unfortunate Events — the best-selling 13-book children's series from Lemony Snicket, the pen name of author Daniel Handler — has been its faithfulness to the text, in how it's hewn closely to the narrative and tone on the page, as it went about telling the story of the Baudelaire orphans being terrorised, over and over, by the treacherous and perpetually-scheming Count Olaf (Neil Patrick Harris). But on the third and final season of A Series of Unfortunate Events, out now on Netflix, its insistence to adapt every book and stick so closely to the written word partially ends up being its undoing. The adventures are more ludicrous than ever — locales involve the top of a freezing mountain and deep underwater in submarines — with A Series of Unfortunate Events season 3 further leaning into its over-the-top and fantastical self. It's part of the whimsicality and zaniness associated with the series, which counts Handler himself as a writer, Barry Sonnenfeld (The Addams Family films) as a director, and both as executive producers alongside Harris. But said adventures just aren't interesting on their own and fail to live up to what we've been treated before, for a variety of reasons. It's the back end of the season, particularly the pair of episodes set in a Wes Anderson-y hotel, that really pull you in. That's also when A Series of Unfortunate Events tackles some meatier, heavier themes around morality, exploring the blurred lines between nobility and wickedness, and re-examining the actions of its central Baudelaire trio: the inventive Violet (Malina Weissman), the bookish Klaus (Louis Hynes), and the biter Sunny (Presley Smith), who's on the verge of not being a baby anymore. As always, the events of their lives force them to grow up faster than most kids would have to, with the Baudelaires learning that the world isn't wholly split into white and black, but rather different shades of grey that people pass through in their lifetimes. Even the kindest among us can be cruel at times, and vice versa. Based on the final four books in Snicket's series, the third and final season of A Series of Unfortunate Events picks up right where the second season left off with its cliff-hanger of an ending, as Violet and Klaus tumble down a slippery (mountain) slope, literally, which soon turns into a literal cliff-hanger as well. Olaf assumes they are dead and is now resting his Baudelaire fortune-seizing hopes on the baby Sunny, who's uttering full words now that everyone ought to be able to understand, though most still don't, not for Sunny's vocal skills (voiced by Tara Strong) but out of their own presumption that a baby has nothing to say. In Olaf's troupe, it's only the Hook-Handed Man (Usman Ally) who does, which hints at a redemption arc. The show's variety and freshness has always depended on the strength of its guest stars and the rotating settings, and the first half of A Series of Unfortunate Events season 3 fails in both regards. There's Olaf's mentors and parental figures, the Man with a Beard but No Hair (Richard E. Grant) and the Woman with Hair but No Beard (Beth Grant), whom Olaf has never been able to impress in his life. Their history of villainy is expected to add a new dimension to the show, but a subplot they put in motion is forgotten and never dealt with. Kit Snicket (Allison Williams, from Girls), introduced late last season as our narrator's second sibling — the first, Jacques (Nathan Fillion), died in season 2, if you recall — is a lot more interesting, for the energy and charm she brings and it's a shame it doesn't use her enough. In fact, this time around, it's the returning stars in Olaf's girlfriend Esmé Squalor (Lucy Punch) and the non-cakesniffing, entitled schoolgirl Carmelita Spats (Kitana Turnbull) that get more material and more time to show off their idiosyncrasies, with Punch making great work of every costume thrown at her in A Series of Unfortunate Events season 3. And the pair of episodes based in Hotel Denouement — somewhat appropriately named given it's the penultimate part of the story and not the final — benefit from the full roster of returning guest stars, bringing together everyone who's still alive, including the likes of Justice Strauss (Joan Cusack), Jerome Squalor (Tony Hale), and vice-principal Nero Feint (Roger Bart), for a pseudo-trial that would be slightly reminiscent of the Seinfeld finale for some. Moreover, A Series of Unfortunate Events season 3 recognises the overuse of the presenter effect, where Patrick Warburton literally appears as the narrator Lemony Snicket, and reins in Olaf's mannerisms and tendency to launch into long explanations, both of which were problematic in season 1 and 2, now and then. And thankfully, it does keep the parts that did work, including the fourth wall-breaking jokes about series entertainment and references to past seasons, in addition to elaborate wordplay construction thanks to Handler's work in the books. Its self-awareness comes at a cost too. Soon after Olaf complains that he doesn't “care about some late series backstory”, the show says goodbye to the characters in question, revealing that it itself never cared about them. Ultimately, the final season of A Series of Unfortunate Events proves to be a mixed bag. On one hand, there's not as much charm to the children's adventures and solutions for more than half the season, with the show happy to settle into a groove that moves things along but hardly innovates on what came before. On the other, thanks to a bit of clever foreshadowing, intentional parallels it sets up through coincidences, more literary and real-world allusions, and some feel-good though as-outlandish-as-ever moments in the finale, A Series of Unfortunate Events season 3 deepens the characters we've known and answers questions we've had. All while doubling down on the lesson that ignorance and selfishness are the true enemies of society. That's a timeless way to go out on. A Series of Unfortunate Events season 3 is now released on Netflix. It adapts the final four books in Lemony Snicket's 13-book series: “The Slippery Slope”, “The Grim Grotto”, “The Penultimate Peril”, and “The End”. 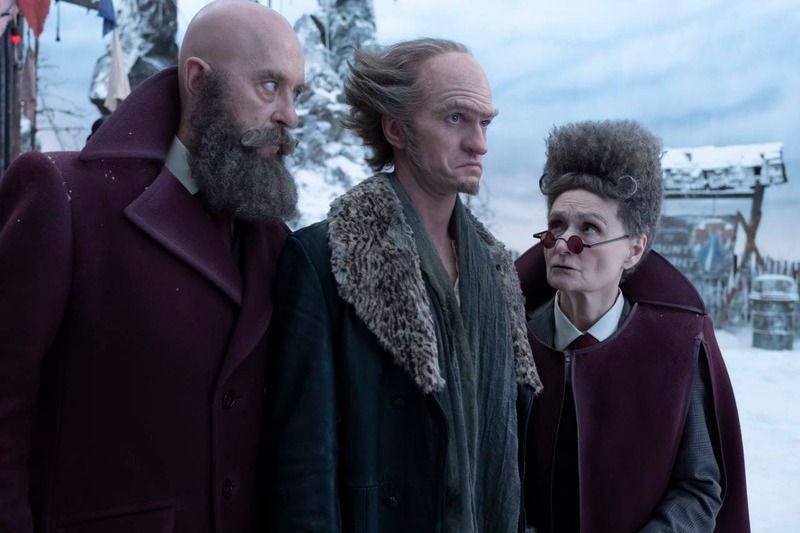 product Neil Patrick Harris returns as the evil, scheming Count Olaf in the third and final season of A Series of Unfortunate Events — out now on Netflix — still terrorising the Baudelaire orphans.